Headquartered in Felixstowe, Suffolk, GB Ingredients Ltd. is a leading producer of fresh yeast for the UK market. It has established an unrivalled reputation for innovation – using its leadingedge skills in biotechnology to harness nature’s know-how in the search for new bakery ingredients and processes. 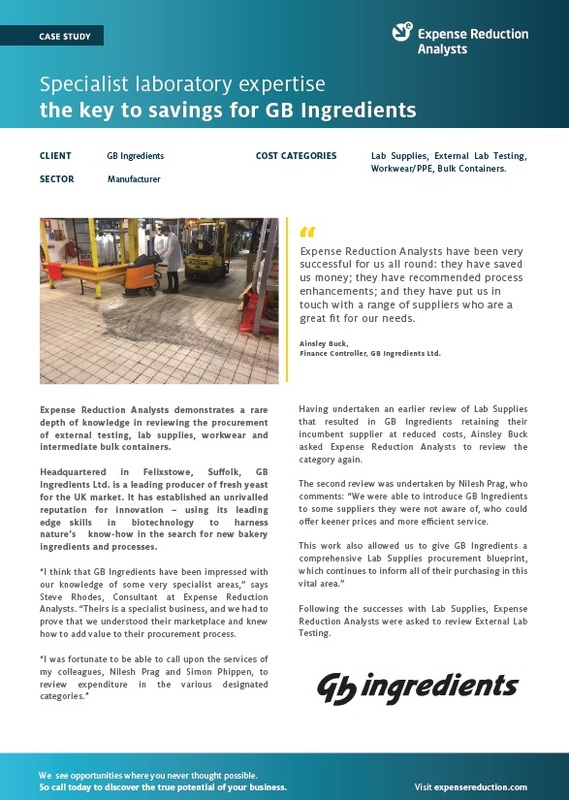 “I think that GB Ingredients have been impressed with our knowledge of some very specialist areas,” says Steve Rhodes, Consultant at Expense Reduction Analysts. “Theirs is a specialist business, and we had to prove that we understood their marketplace and knew how to add value to their procurement process. To find out more about how ERA helped GB Ingredients, including results, savings and more details from the client, download the full case study now. Ainsley Buck, Finance Controller, GB Ingredients Ltd.